Home / Visit Sunbird at Datacenter Forum Copenhagen! 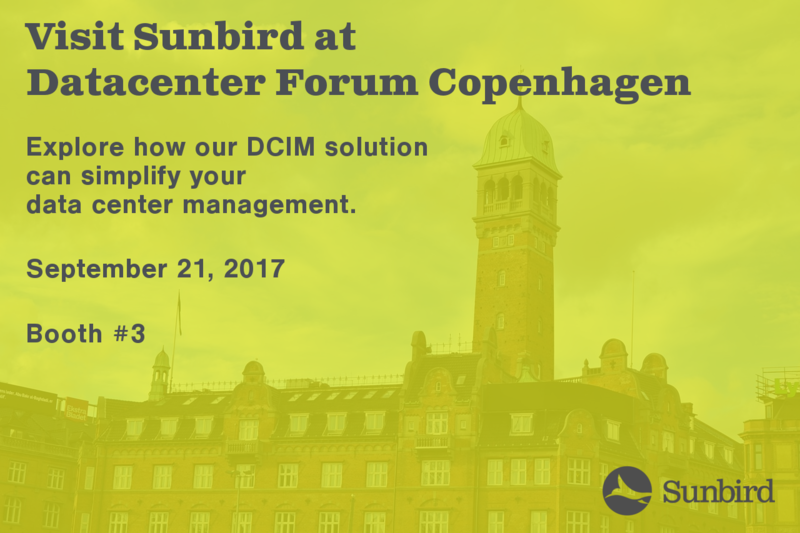 Visit Sunbird at Datacenter Forum Copenhagen! Sunbird is excited to be attending Datacenter Forum Copenhagen on September 21, 2017 at the Radisson Blu Scandinavia Hotel. Stop by to meet our data center experts and get a demo of the new features and enhancements in our award-winning Data Center Infrastructure Management (DCIM) solution. Join over 200 of your colleagues from the data center industry that are involved with managing the operations of their organization's IT infrastructure. You won't want to miss Niall Bannon, DCIM EMEA Techical Sales, give his presentation on the Top DCIM Dashboards for Tackling IT Operational Challenges. Learn more and register here. Heading to Datacenter Forum Copenhagen and want to chat one-on-one with a DCIM expert? Our local Sunbird representatives will be available for individual meetings. Let us know if you'd like to meet.